Huggled: Ickle Baby Bot Review! So this cute little fella is from LUSH and as the title suggests he's called Ickle Baby Bot and costs only £1.95. How much cuter could he get? I think it's mainly to relax children at bedtime but I couldn't resist getting him myself. This bath bomb is designed for delicate skin and contains aromatherapy oils to soothe you. It has 11 ingredients in total including: Lavender oil, chamomile blue oil, citric acid and sandalwood oil. 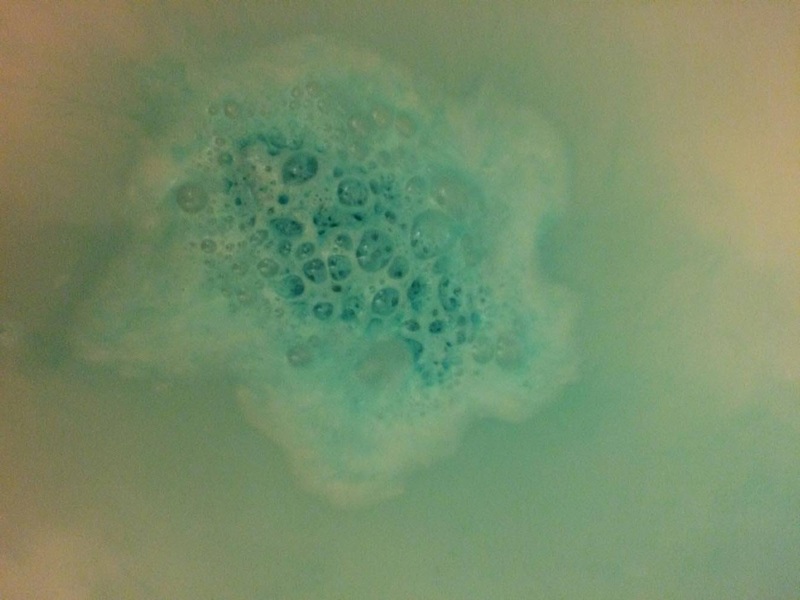 Above is a picture of the bath bomb when I put it under the water as you can see it turns the water baby blue and it looks gorgeous! As soon as the bath bomb hits the water the smell of lavender hits you it smells amazing, Once the bath bomb has fizzles out I couldn't really smell the lavender anymore but the bath water looked amazing and was very calming. Even though they state it's for children if you have sensitive skin this is an ideal bath bomb for you since it is so gentle on the skin. After reading other people's reviews they also state that the bath bomb has helped with their insomnia. I can vouch for this, the combination of the lavender and hot water is so relaxing. 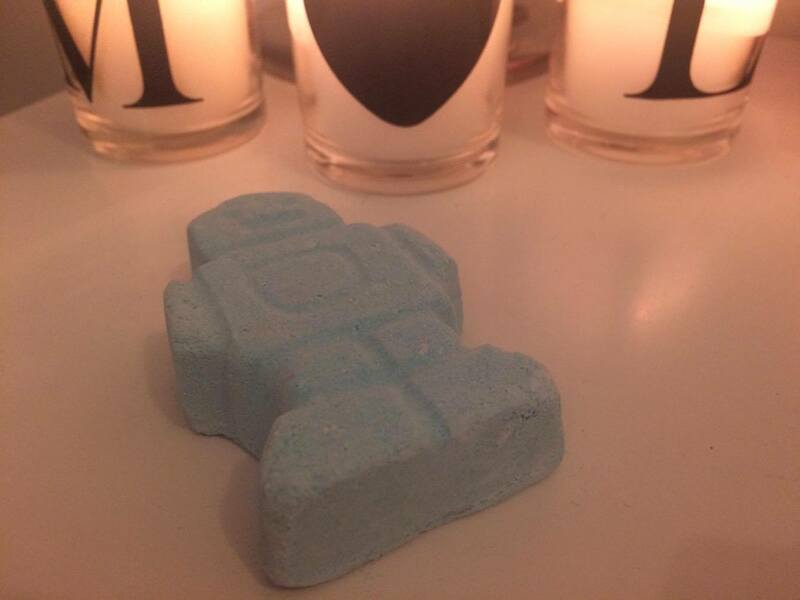 If you would like to purchase this bath bomb the link is below. So cute and so cheap as well, made me really sleepy after! On their website in the description they sort of 'pitch' it to children because it's for sensitive skin so it's more ideal for them but that doesn't mean that adults can't use it? They have some products which are quite good for children such as the modelling clay you can wash with! This looks so cute! I love the sound of the ingredients! They're heavenly, it smells amazing when it's fizzing! Love the ingredients, I need to try it out. You should it's really gentle on your skin and smells amazing! Such a pretty color in the water! Such a lovely baby blue isn't it? I had one of these for Christmas and I can't wait to try it out now! I've never been the best sleeper so it's good to hear that it could help with that sort of thing. The lavender in it is really relaxing hopefully it will help you! I found it cute too! It's lovely I will definately be repurchasing! Lavender + hot water is always such a dream! I know it was heavenly! This is one of my fave Lush products it's so cute! There are some lovely ones in their valentines range! Ah! I cannot get enough of Lush - love their products, they're absolutely gorgeous, smell amazing and leave skin feeling super-soft and smooth! Love, love, love! Real Techniques - Multitask set! Before he Kills: A free read! Essentials for the Student Nurse! My (slightly late) 2017 goals!